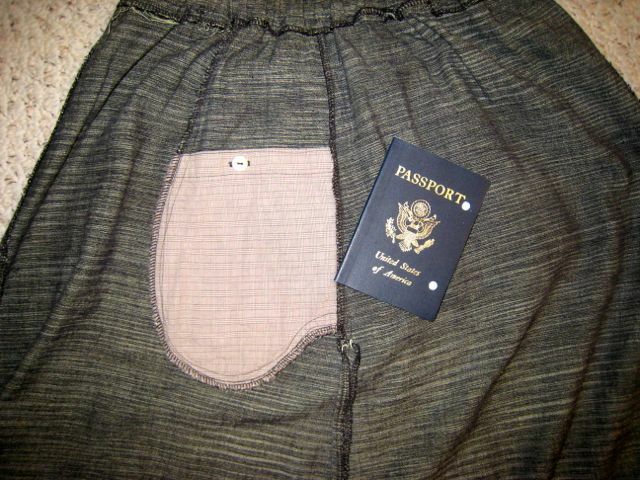 Melissa's posts about sewing for her upcoming trip to Mexico reminded me that I never posted a tutorial about how I add interior pockets to my travel clothes. Recently, she showed how she added an interior flip-up pocket to her orange skirt. I used to do that, but I switched to this method. 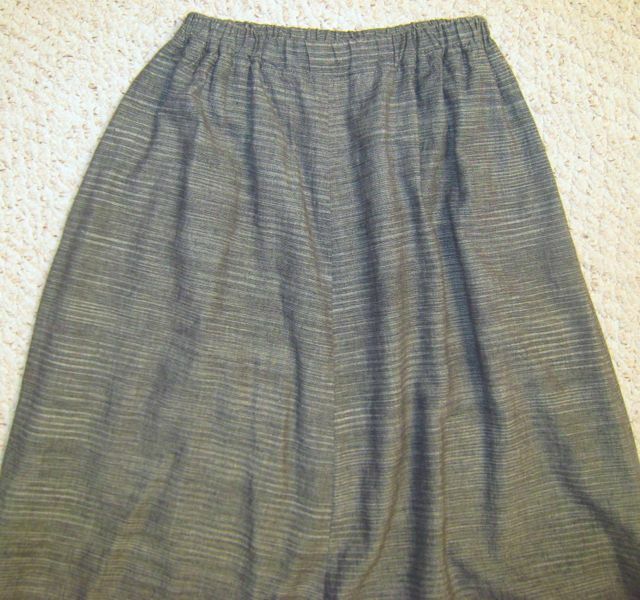 This skirt is so voluminous, you can't see either the side seam pockets or the interior pockets. But, believe me, it is virtually invisible even in a slimmer skirt. Remember Butterick 3133, which I wore in practically all of my Tanzania trip pictures? I put pockets on the inside, too. It's embarrassingly easy. A normal side-seam pocket will have 2 pocket pieces. Typically, I use a lightweight material for the other pocket piece (the one you can't see). It reduces bulk without sacrificing sturdiness. Just (partially) back the inner pocket piece with the same lightweight shirting. Turn down the top of the shirting twice to make it stable enough to make a buttonhole. Make a buttonhole near the middle of the top edge. Check the buttonhole alignment and iron a square of interfacing to the inner pocket piece before you sew on a button. Baste the two layers together and treat them as one while you sew the pocket as normal. In a paneled skirt like Melissa's, you could easily add this style of interior pocket, securing it at the waistband, side and front panel seams. No telltale stitching lines indicating an interior pocket will be visible from the outside. I've ordered a bunch of Saf-T-Pockets patterns. Although I haven't sewn any of them, I read all the instructions. The money was well spent because the patterns have ingenious ideas of how to hide pockets in all sorts of places. If you have sewn Saf-T-Pockets designs, can you comment about your experience? Which one should I try first? I haven't sewn any of Marsha's patterns but I liked seeing her fashion show last year. I liked the Flounce About Jacket the best and there are several variations of it on her Facebook page.